Common Chokecherry This tree is ‘Mountain Grown’ at Alpha Nursery and is an ‘Idaho Preferred’ Plant. 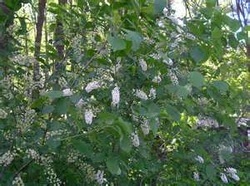 Common Chokecherry is shade tolerant, grows in a variety of soils and is tolerant of drought. The fruit is good for jams and jellies. Wildlife and birds are attracted to the fruit. It is native to our area. The leaves of this tree turn red in the fall. This tree will tolerate wet soils and is also a Firewise plant.